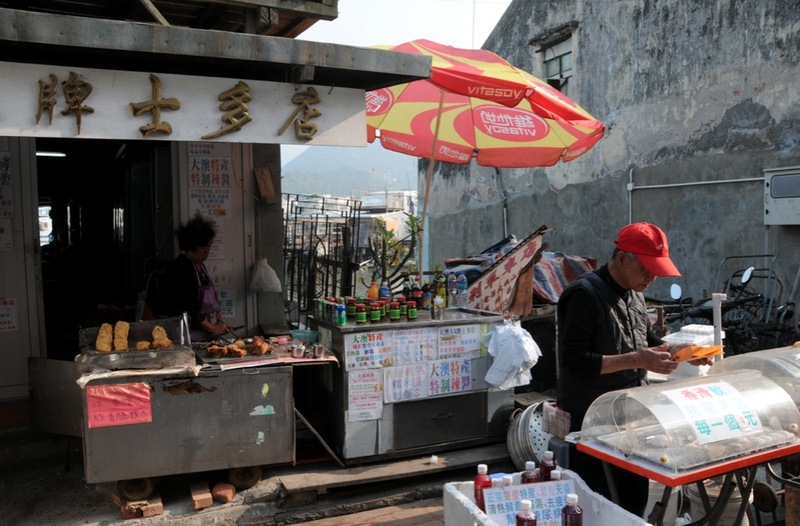 You can get street food everywhere in Hong Kong and Macau – but of course, also in Tai O on Lantau Island. 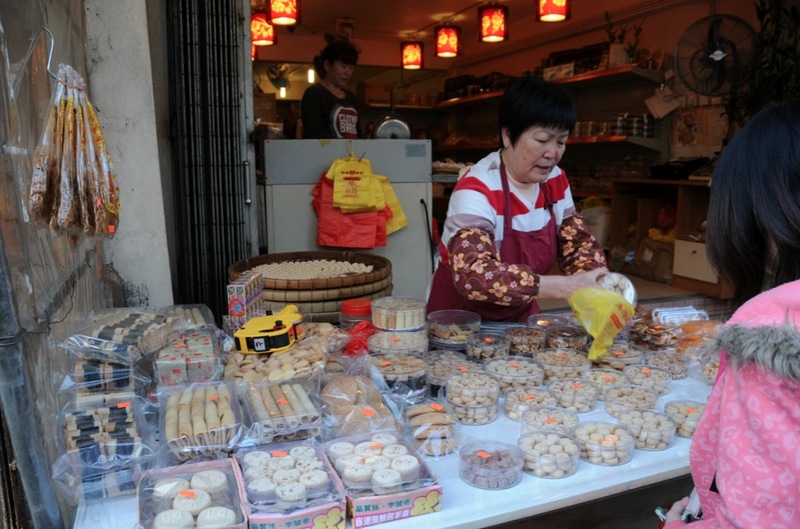 I was surprised at the range of different foods that you can try and buy there, at very affordable prices. 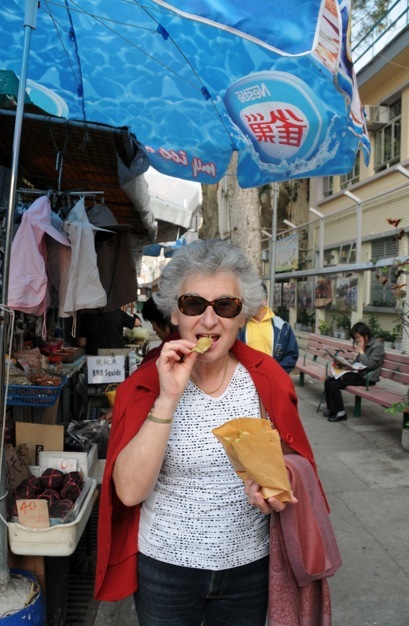 Just a few minutes after the bridge over the creek we encountered a lady baking Macanese almond cookies. Next to her, another lady grilled oysters which were filled with cheese. 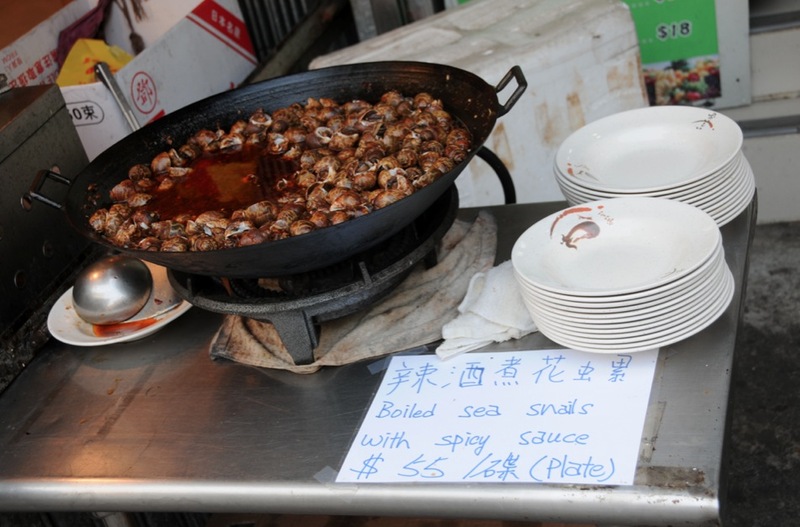 I had tried oysters baked with cheese in Sanya and I did not like them much, but I guess whoever is a fan of baked oysters might like to give them a try in Tai O.
Boiled sea snails were another option on the menu. They looked interesting, but not convincing enough for me to give them a try. 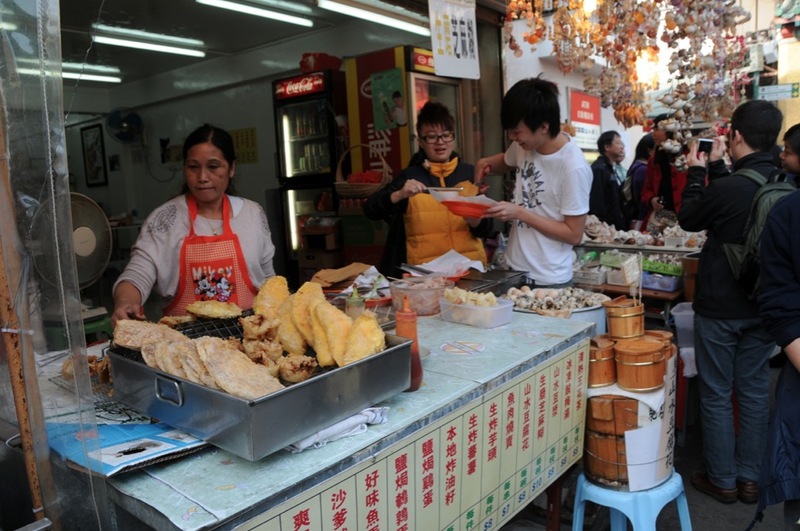 Fried fish and vegetables was sold at many different street corners – and that’s something that can be really nice, especially pumpkin and sweet potatoes (but of course, different people have different tastes, you might like something else better!). 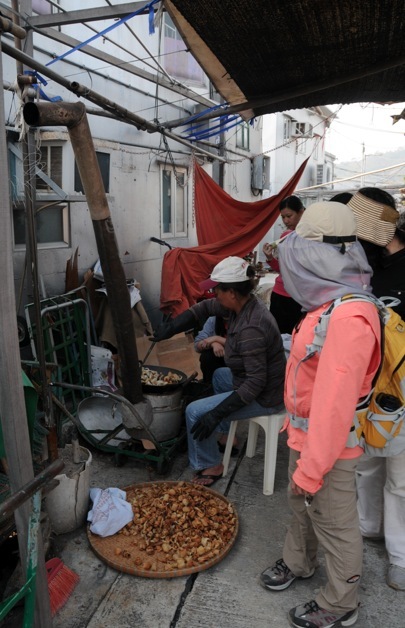 Here in this picture below, the lady in the back sells fried vegetables (and yes, the sweet potato we tried was really tasty) and the gentleman in the front sells red bean curd pudding on a stick. 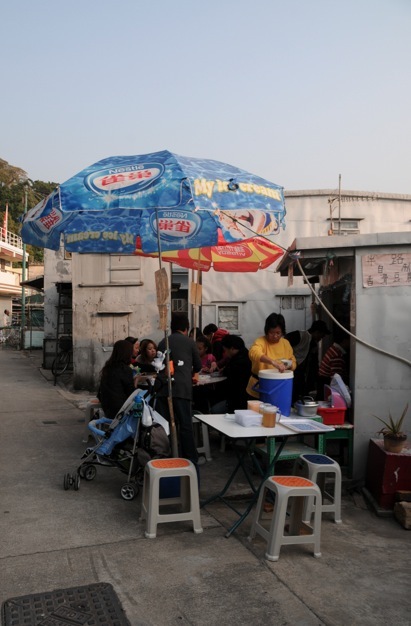 For 4 HKD the pudding is a bargain, plus you get a big smile from the vendor on top. 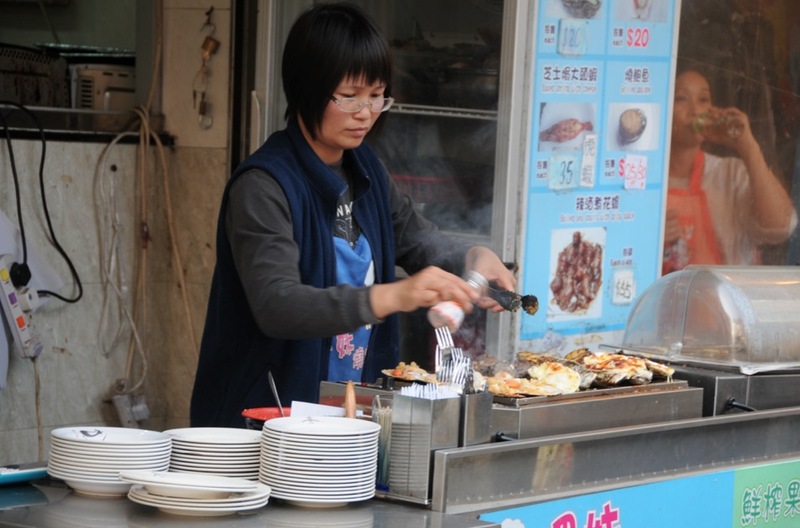 At the next corner, a lady dried octopus and squid in a big basket – the grilled seafood is then left to cool and can be stored safely as long as it is fully dried. To eat, you just reheat or grill it, cut it in pieces and chew on it. 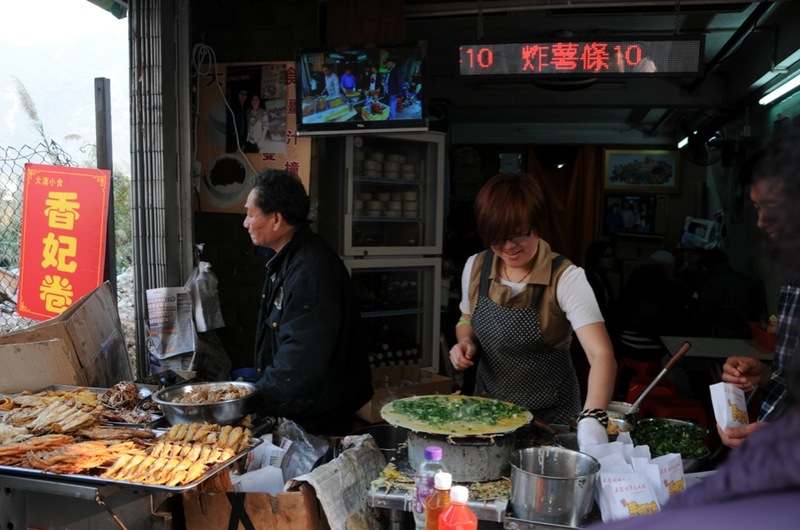 This lady produces a fresh omelet with spring onions and anything that you like – ranging from dried shrimp and seafood (no surprise here, you can get dried seafood at every corner in Tai O) to more vegetables in form of onions, peppers and even eggs! 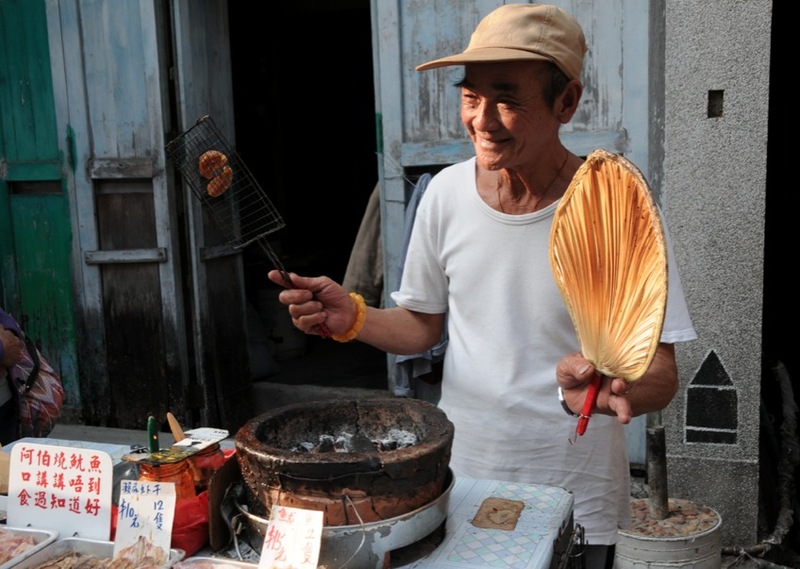 The elderly gentleman on the picture below also sold grilled squid, and he performed such a great one man show that we were so convinced to buy our squid from his stall. He made it extra spicy (we did ask for it) and laughed when we pulled our faces a little bit – but it was fine, nothing to worry about. 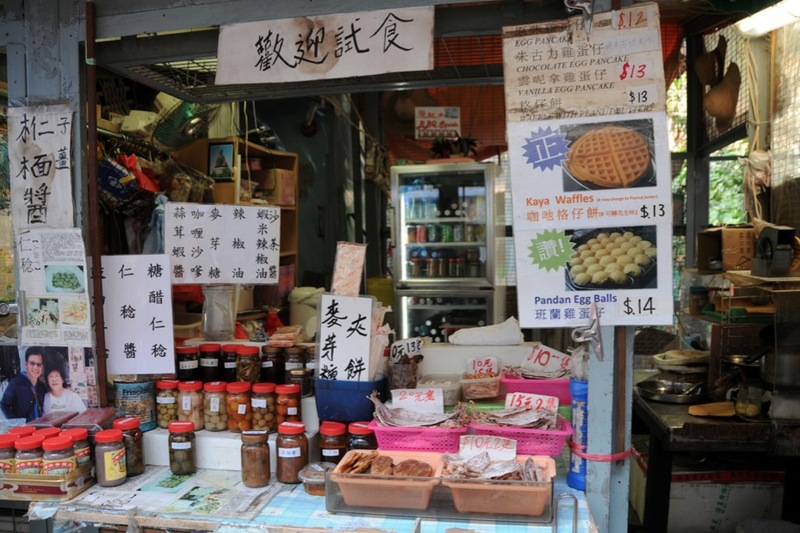 Lots of stalls sold pickled fruit and vegetables, shrimp paste and dried fish – but also egg waffles. The one that we picked to try actually sells pandan-flavoured waffles, which are a little bit nutty in taste. 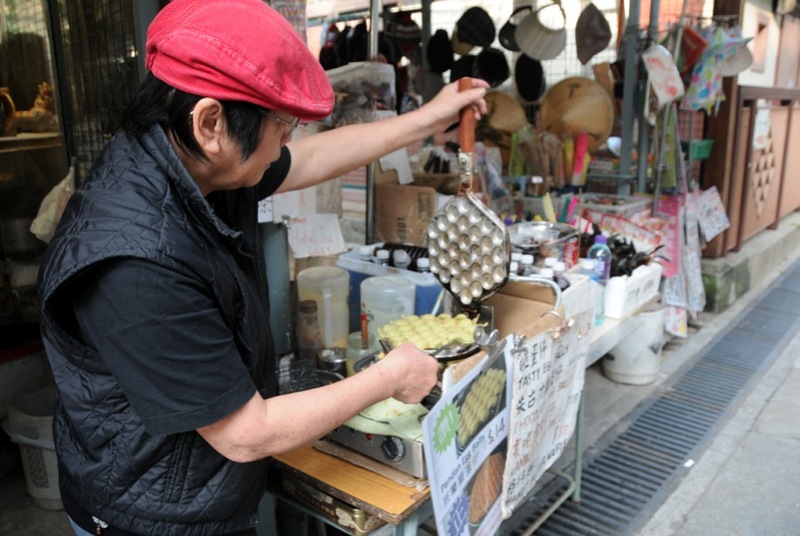 I’ve never seen such waffles before coming to Hong Kong, but you can find them everywhere in Hong Kong. They make great tasty waffles, very crunchy on the outside but soft inside. We tested them and we have to confirm, the waffles are tasty – especially with the nutty, botanical pandan-flavour. Finally we’ve had enough food and had to give the beancurd dessert cafe a miss – maybe next time?